AUBURN, Wash. (August 14, 2016) – In one of the most explosive races in Washington history, Point Piper overpowered 10 rivals including 6-to-5 favorite O B Harbor and two-time defending champion Stryker Phd and rolled to a 4 ¾-length victory Sunday in the $200,000 Longacres Mile (G3) at Emerald Downs. With two-time Kentucky Derby winning jockey Mario Gutierrez aboard at 118 lbs, Point Piper ran one mile in 1:32.90 to break the track and state record of 1:33 set by Sky Jack in the 2003 Mile. Point Piper, third choice in the wagering, paid $12.20, $6 and $4. Jerry Hollendorfer, who also trains runner-up Cyrus Alexander, is the winning trainer and co-owns Point Piper with Dan Gatto of Encinitas Calif. and Peter and Timothy Russo of Las Vegas. Cyrus Alexander, ridden by Norberto Arroyo Jr. at 119 lbs, finished second and paid $6.80 and $4.40, while O B Harbor, with Jose Zunino riding at 123 lbs, held third and paid $2.80. Alert Bay, second choice at 4-to-1, finished fourth and was followed by Stryker Phd, Sammy Mandeville, Dedicated to You, Star Student, Sabado Alegre, Indian Brut and Prime Engine. Attempting to sweep the older handicap division, O B Harbor rocketed to a three-length lead and set taxing fractions of :22.66, :44.70 and 1:08.76, and remained in control to the top of the lane, but Cyrus Alexander and Point Piper unleashed wicked rallies, especially the latter. In mid-pack early, Point Piper swung three-wide into the lane and collared the leaders in a spectacular burst more typically seen by turf milers. “I think they put a really fast pace up front,” Gutierrez said. “By the time I hit the stretch and I asked him, he just exploded. He had a lot of energy to use at the end. A 6-year-old Kentucky-bred by Giant’s Causeway-Imagine, Point Piper earned $110,000 to lift his career total to $389,135. His record is 5-5-4 in 24 starts including several races in Grade 1 and Grade 2 company. Although assistant trainer Dan Ward handled saddling duties for Point Piper and Cyrus Alexander at Emerald Downs, Hollendorfer watched the race at Del Mar and admitted to being a bit surprised by Point Piper’s explosive race. Some speculated that Point Piper’s 1:32.90 might be the fastest two-turn dirt mile in North American history, but more research is required. In any event, it was an incredible performance by a horse who’s previous victory was nine starts ago in the 2015 Harold F. Brubaker at Del Mar. Cyrus Alexander appeared a threat to win the race, making a looping wide move into the lane, and was gaining on O B Harbor when Point Piper swept to the lead. As for O B Harbor, Zunino said the 4-year-old Oregon-bred wasn’t as easy to settle as in his previous two routes. Bidding to become the first three-time winner in Mile history, Stryker Phd ran on late to finish fifth and was rewarded a big hand while being unsaddled in front of the grandstand. The only jockey to win the Kentucky Derby and Longacres Mile in the same year, Gutierrez has now accomplished the feat twice—I’ll Have Another and Taylor Said in 2012 and Nyquist and Point Piper in 2016. Afterward, he said Point Piper is a perfect Longacres Mile horse. “The distance is perfect for the type of horse that he is,” Gutierrez said. NOTES: Sunday’s handle of $2,866,842 was up over $400,000 from last year. . . Remembertobreathe ($44.80) invaded from Hastings Racecourse to capture the $22,500 Pete Pedersen Memorial in 1:34.93 for one mile. Amadeo Perez rode the 5-year-old Florida-bred for trainer Sylvea Gregory and owner David Gregory. . .In the $20,500 TVG Purse for 3-year-olds, Algenon ($6.20) came off a six-month break and out finished The Press in 1:08.29 for six furlongs. Eswan Flores rode the winner for trainer Len Kasmerski and owner/breeder Roz Barclay. A Kentucky-bred by Aragorn-Alpine Yodel, Algenon is 3-3-3 in 11 starts with $99,212 in earnings. . .Rocco Bowen swept the first three races and enters the final four weeks with a 91-58 lead over Leslie Mawing in the jockeys’ standings. 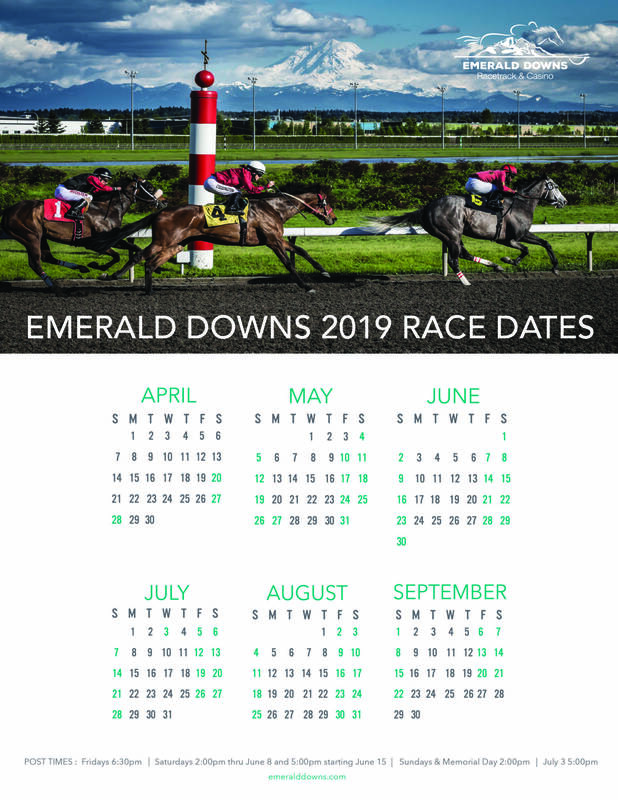 Bowen already has 18 wins this month and has at least one win on 23 consecutive cards. . .Flores rode two winners Sunday including a $42.40 upset on Perhaps a Pie ($42.40) in the $65,000 Emerald Distaff. The $2 win payoff broke the Distaff mark of $37.20 set by Ignite the Passion in 1999. . .Copy Begone ($5.20) became the first five-time winner at the meet with a head victory over even-money favorite Trinni in Sunday’s third race for 3-year-old fillies. Ridden by Bowen for trainer Steve Bullock and owners David Israel, Al Adams and Charlie Clark, Copy Begone ran 6 ½ furlongs in 1:16.70. A bay filly by Demon Warlock–Run a Copy, Copy Begone is 5-0-0 in six starts this season with earnings of $39,630. . .Four Longacres Mile-winning jockeys won races Sunday—Perez, Mario Gutierrez, Juan Gutierrez and Leslie Mawing. . . Gallyn Mitchell, Emerald Downs’ all-time leading rider with 1,419 wins, celebrates his 54th birthday Monday. “Booger” remains the only jockey to sweep the Longacres Mile and Emerald Distaff in the same year with Edneator and Fleet Pacific in 2000. . .Live racing resumes Friday with first post 6:30 p.m.